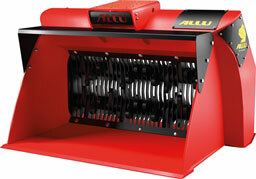 ALLU DL 2-09 / ALLU DL 2-12 / ALLU DL 2-17 The ALLU DL Transformer Series is a perfect solution for excavators, tractors and backhoes with a 4 to 12 ton capacity. It is a perfect attachment for agriculture and landscaping applications like compost areation ,top soil screening and waste/debree screening. Because processing can be carried out on site with the ALLU DL-Series Transformer, it offers you versatility and efficency in your project.